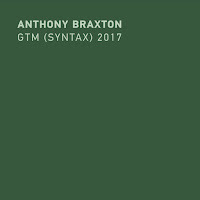 In what is perhaps a somewhat unexpected move, Anthony Braxton is treating us to an impressive string of concerts and releases to celebrate his 69th birthday – I say unexpected not because this occasion doesn’t warrant at least some fuss, but because most people would’ve waited another year to open the vaults in such a way. However, if you’re a seasoned Braxton-follower, you’ve learned to expect the unexpected from the legendary saxophonist/composer, and if you have some knowledge of his writings, you’ve probably figured out already why he’s celebrating his 69th birthday as though it were his 70th. It’s no mere quirk of Braxton’s, as it’s a number divisible by three, which in turn plays a central role in his philosophy. While I’m not familiar with his “Tri-Axiom” writings, the information available on the internet suggests that this preoccupation with the number three results from Braxton’s aversion to simplistic dichotomies (such as “composition vs. improvisation”): In quasi-Hegelian fashion, he’s attempting to undermine such oppositions by introducing a third term that lies in between (in the above-mentioned musical dichotomy, that term would be “intuition”). In light of this, it’s safe to assume that the release of a trio recording is no mere coincidence. 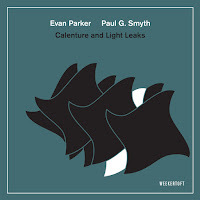 That being said, the recording to be reviewed here – featuring drummers Tom Rainey and Tomas Fujiwara alongside Braxton – is not only in this rather superficial way related to the philosophical concepts just mentioned. An aspect that shouldn’t be omitted here is the fact that Trio is the outcome of a very specific music-making method dubbed “Falling River Music”. The basic idea behind this Braxtonian method or “musical system” is that the musicians play from large abstract paintings, with only a minimum of graphic notation providing more traditionally “musical” orientation. 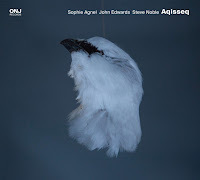 On Trio, this approach results in a music that is “in between” indeed, music that is neither completely free (improvisation) nor rigidly constructed (composition, classical music), music that feels both deliberate and mercurial. It’s uncannily life-like, with ad hoc structures emerging and then collapsing, only to give way to new ones. This renders futile any attempt to describe the four compositions – each of which is about an hour long – by employing the usual music-crit tropes (or maybe I’m just not up to it). It seems more appropriate to focus either on the general approach of the three musicians or to single out some particularly interesting passages or details. 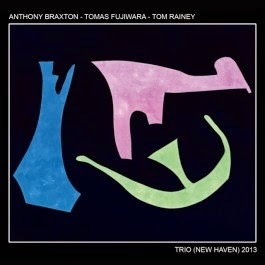 Something that’s immediately striking is the playing of Tom Rainey and Tomas Fujiwara. 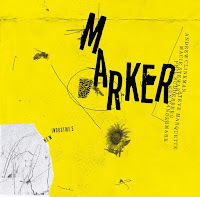 A record so heavy on drums certainly runs the risk of becoming monotonous, especially if it’s four hours long, but Rainey and Fujiwara are true wizards who manage to invalidate such concerns within a few measures. Here, they employ a wide variety of approaches, ranging from the meter-less “pulse” of classic free jazz to “melodic” playing that fully exploits the timbral possibilities of the drum kit. At times, their playing even seems oddly “visual”, eschewing a sense of forward motion in favor of audible quasi-shapes. The way they interact is also noteworthy, as they don’t always play in tight lockstep, but frequently opt for what could be called “inter-independence” – giving free rein to each other, yet somehow managing to stay attuned to what the other does. Likewise, Braxton does his best to keep things from getting stale – he runs the gamut from sopranino down to contrabass (!) saxophone, omitting only the tenor sax. Throughout the entire recording, he alternates mainly between disjointed abstractions and the kind of fluid high-register runs that no one else does quite like him – with some vaguely folk-ish themes cropping up here and there, too. A high point comes on in the last few minutes of Composition No.364A, when Braxton indulges in trilling sounds that wouldn’t seem out of place in a particularly virtuosic birdsong. Still, the percussive pyrotechnics of Rainey and Fujiwara often steal the show from the jubilarian; in what is perhaps my favorite passage on the entire recording – roughly the first quarter-hour of Composition No.364F –, they allow their playing to become as fluid as water, starting out with quietly gurgling sounds but growing increasingly louder and more voluminous – like shallow brooks and pools during torrential rainfall –, until the drumming washes over the listener in a tidal wave of pure sound. As you can probably tell by now, Trio can be an exhausting listen – it’s certainly too much to take in one sitting –, and it does meander a bit from time to time. Still, to award anything but five stars would be philistine considering the scope and overall quality of this recording – even though five isn’t divisible by three. 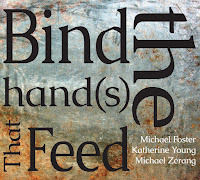 Listen and buy at the Tri-Centric Foundation’s homepage. The drummer's name is actually Tomas, not "Thomas" (it's pronounced TOE-MA). @Anonymous: Thanks, it's been corrected (chalk that one up to force of habit).